Dioscorea japonica, known as East Asian mountain yam, yamaimo, or Japanese mountain yam, is a type of yam (Dioscorea) native to Japan (including Ryukyu and Bonin Islands), Korea, China, Taiwan, and Assam. Dioscorea japonica is used for food. 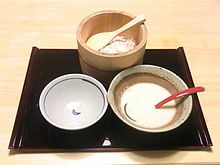 Jinenjo, also called the wild yam, is a related variety of Japanese yam that is used as an ingredient in soba noodles. In Japanese, it is known as yamaimo (山芋) "mountain yam". Jinenjo (自然薯) "wild yam" is another kind of Dioscorea japonica, which is native to fields and mountains in Japan. In Korean it is known as cham ma 참마, as well as dang ma 당마. Dioscorea japonica contains the antimutagenic compounds eudesmol and paeonol. ^ English Names for Korean Native Plants (PDF). Pocheon: Korea National Arboretum. 2015. p. 442. ISBN 978-89-97450-98-5. Retrieved 4 January 2017 – via Korea Forest Service. ^ a b c "Dioscorea japonica in Flora of China @ efloras.org:". Missouri Botanical Garden, St. Louis, MO & Harvard University Herbaria, Cambridge, MA. Retrieved 21 January 2012. ^ Ohwi, Jisaburo (1965). Meyer, Frederick G.; Walker, Egbert H. (eds.). Flora of Japan. Washington, DC: Smithsonian Institution. p. 314. OCLC 742327504. Retrieved 21 January 2012. This page was last edited on 26 February 2019, at 23:32 (UTC).